News from the Colorado State Capitol of a Senate bill that would effect a solar powered Colorado hyperloop. Senate Bill 44. The bill would roll back Colorado’s renewable energy goals, currently set at 30 percent by 2020 for investor-owned utilities, to half of that — or 15 percent. The goal for rural cooperatives, which currently need to get 20 percent of their energy from renewable resources by 2020, would be rolled back to 15 percent under the proposal. It is ironic that a small group Colorado citizens would want a small portion of their energy bills to contribute more to the “Brown Cloud” along the front range where most of Coloradans live. Because its easy to make critiques at every new technological advancement, see the LED debate below, the Colorado Hyperloop would like to congratulate Gary Truesdale’s latest Hyperloop Efficiency Concept. The video below shows how he made a device that could reduce overall energy use of each hyperloop pod and tube sections by forcing air circulation in the Hyperloop system. Good job Gary, keep up the innovations! With innovations like the one above, the Colorado Hyperloop will be using the most energy efficient and lowest carbon renewable energy technology currently available. So it was interesting to read this Op-Ed in the New York Times about the recent Nobel Prize for the blue/white LED. The winners, Shuji Nakamura, an American, and Isamu Akasaki and Hiroshi Amano, both from Japan, justly deserve their Nobel, and should be commended for creating a technology that produces the same amount of light with less energy. The I.E.A. and I.P.C.C. estimate that the rebound could be over 50 percent globally. Recent estimates and case studies have suggested that in many energy-intensive sectors of developing economies, energy-saving technologies may backfire, meaning that increased energy consumption associated with lower energy costs because of higher efficiency may in fact result in higher energy consumption than there would have been withoutthose technologies. I agree. Determining whether new energy efficient technology increases overall energy demand is a mute point. The more people there are on the planet the more energy will be used. So we must use cleaner energy. But this is having it both ways. They really need to make it clear that the formula is: efficiency gain vs cost (monetary and environmental). For example, just as the individual LED is wonderful, more breakthroughs in lighting are just around the corner with OLEDS. Renewable energy technologies – including solar, wind, hydroelectric, and bioenergy – are essential tools in the path towards modern, low-carbon energy systems. But like all energy technologies, they have significant costs and impacts. Understanding their scalability and effects on the landscape will prove essential in crafting renewable energy innovation policy. Economists have long recognized innovation’s central importance to economic growth, but have still not come to terms with the reality that “general-purpose” technologies like electricity, microchips, and the Internet often emerge from long-term public-private partnerships. And since no two technologies are exactly alike, case studies of successful innovation policy must be carefully analyzed to spur similar successes in the future. Anyway, they have a lot of smart people in that institute but they have yet to publish any findings on a future Hyperloop. Hopefully, the Colorado Hyperloop will be of interest to them. If Colorado communities were looking for one more reason to shift towards transit-oriented development, they may have found it. Cities that have denser, more compact living conditions are likely to have lower disease rates and obesity rates, according to a new University of Colorado Denver study. “While it is possible to lead an active, healthy lifestyle in most any type of neighborhood, our findings suggest that people living in more compact cities do tend to have better health outcomes,” said Wesley Marshall, assistant professor of engineering at CU Denver. Good job CU Denver Department of Civil Engineering! Cities of the 21st century should be lively, safe, sustainable and healthy cities. Jan Gehl tells us how all of these qualities can be achieved through the policy of making walking and cycling the preferred mode of movement in the city. To me, a sustainable city would be a very people-friendly city. It would be a city with good public spaces and a city that is rather compact. It would be a city that really invites people to walk and bicycle as much as possible. A good walking and cycling environment with a good public realm is also a good environment for public transport, so there is an important connection here as well. Strengthening public transportation will be essential in the future, in order to become less dependent on private cars and also in order for the city to become more people-friendly. Having a hyperloop station in the most densely populated areas with best pedestrian and public transport access would be ideal. Im just not sure how that would work though… but thats why we need to start thinking big. We tend to view an unhealthy diet and physical inactiveness as personal life style choices – but there are some important questions, we should be asking before we draw that conclusion. Is it easy to walk or bike from A to B where you live? Are there healthy foods available at your local grocery store? Are there enough green spaces, where your busy city mind can take a break and you can breathe in clean air? Being unhealthy is only a lifestyle choice if there is an alternative. And there are many ways in which cities can encourage a healthier way of life. The rapid urbanization puts pressure on city planners, policy makers and architects to create healthy, sustainable and socially-functioning cities for the 6.3 billions who will have moved to a city by 2050. One thing is creating homes for all these people, it’s another thing to create the spaces between the homes that encourage us to live healthy lives. One thing is clear, healthy cities don’t just happen – they are built on purpose. When we don’t just consider health a personal issue, we open our eyes to the health potential in the spaces we share. We could open up for more outdoors classes for school children, and more walking meetings for the workforce. If we make active transportation a priority, we would build cities that make it easy to walk and bike around and thereby reduce commuting by car, and if we acknowledge that a healthy diet can prevent many chronic diseases, we would have more city gardens and the availability of local foods would rise. And if we build spaces that encourage different people to meet and have a conversation, we will have created a city with more cohesion and less loneliness. Health is no more a personal issue than sustainability or traffic safety is. Furthermore, it is a cross-sector job, where different stakeholders need to work together in order to create a healthy city. Only in the space between city planners, architects, politicians, healthcare professionals and other vital societal arenas can we create cities that are truly forpeople. Artist and activist Alfred Twu’s image. High-speed rail was supposed to be President Obama’s signature transportation project, but despite the administration spending nearly $11 billion since 2009 to develop faster passenger trains, the projects have gone mostly nowhere and the United States still lags far behind Europe and China. Local and state officials Monday touted the importance of two huge transportation projects as keys to congestion relief and economic growth in Colorado. But while the FasTracks mass-transit plan in the Denver metro area and the Twin Tunnels expansion in Idaho Springs are rolling along, those and others like it could be stymied by federal lawmakers who can’t agree on a long-term funding package for roads, said U.S. Sen. Michael Bennet, D-Colorado. 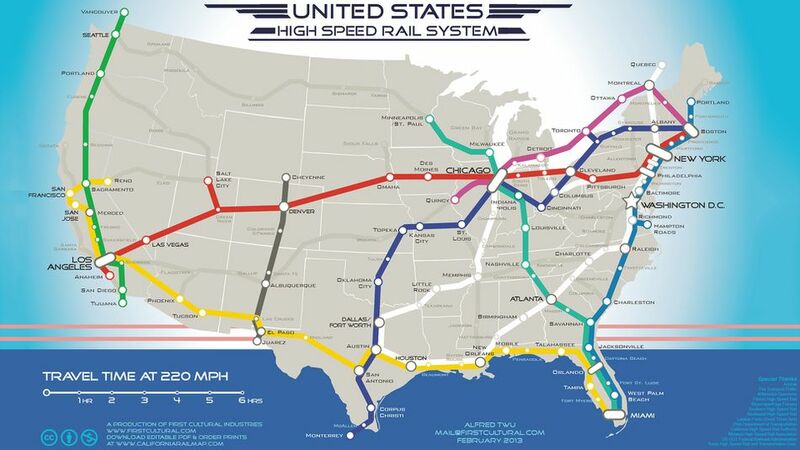 Seems like everyone is touting the relief that Rail/Hyperloop will bring. But don’t forget Buses! It’s a problem of supply and demand: There is a massive construction boom right now but construction workers are few and far between. Largely fueled by the energy industry, tens of billions of dollars of development is in the works along the Gulf Coast and in the Midwest. The Associated Builders and Contractors estimates the construction industry is facing a shortage of almost 2 million skilled workers by the end of the decade. The hyperloop can be different. Automation and robotics can be designed to install prefabricated modular units of the hyperloop. According to Melonee Wise, the manual laborer of the future has only one arm and stands just three feet, two inches tall. Such are the vital statistics of UBR1, a $35,000 mobile robot unveiled today by Wise’s startup company Unbounded Robotics. Though robots have long been a part of manufacturing, they have traditionally worked in isolation. But in recent years, thanks to advances in hardware and software, new kinds of robot have begun to appear among human workers in factories and warehouses. Decent article that says no matter the cost of transportation (like ownership costs of a car or the cheapness of a bike), time is often deciding factor for Americans. This is precisely why the Colorado Hyperloop is a good match for time, distance and cost. These two technology advances will help with the implementation of the Colorado Hyperloop. They also had large converging in the news sphere. New record for a trapped field in a superconductor, beating a record that has stood for more than a decade, could herald the arrival of materials in a broad range of fields. Instead of monorails, lets think of hyperloops. Next, the Denver haze/brown cloud has been monitored from Space! Anyone living in a major U.S. city for the past decade may have noticed a change in the air. The change is apparent in new NASA satellite images unveiled this week that demonstrate the reduction of air pollution across the country. After ten years in orbit, the Ozone Monitoring Instrument (OMI) on NASA’s Aura satellite has been in orbit sufficiently long to show that people in major U.S. cities are breathing less nitrogen dioxide – a yellow-brown gas that can cause respiratory problems. Satellite data show that Denver has seen a 22 percent decrease in nitrogen dioxide between the 2005-2007 (left) and 2009-2011 (right) periods. NASA’s Discover-AQ, a multi-year airborne mission, is flying this summer in Denver to learn more about the region’s wide range of air pollutants. Nitrogen dioxide is one of the six common pollutants regulated by the U.S. Environmental Protection Agency (EPA) to protect human health. Alone it can impact the respiratory system, but it also contributes to the formation of other pollutants including ground-level ozone and particulates, which also carry adverse health effects. The gas is produced primarily during the combustion of gasoline in vehicle engines and coal in power plants. It’s also a good proxy for the presence of air pollution in general. Air pollution has decreased even though population and the number of cars on the roads have increased. The shift is the result of regulations, technology improvements and economic changes, scientists say. In fact, about 142 million people still lived in areas in the United States with unhealthy levels of air pollution, according to the EPA. Also, high levels of air pollution remain an issue in many other parts of the world, according to the global view from satellites. “While our air quality has certainly improved over the last few decades, there is still work to do – ozone and particulate matter are still problems,” said Bryan Duncan, an atmospheric scientist at NASA’s Goddard Space Flight Center in Greenbelt, Maryland. Decision makers and regulatory agencies like EPA have long relied on data from ground sites to inform air quality science and forecasts. NASA, while not directly involved with regulation or making forecasts, provides a consistent, global, space-based view – not possible from any other source – of when and where air pollution occurs. The hyperloop will further decrease the use of gas engines and coal power plants. So lets hope those superconductors get implemented soon into transportation and lets hope the satellites monitoring the NO2 continue to work for years to come! Currently all types of public transportation range from very cheap very expensive. Could the Hyperloop be the Uber of the train system? iE cheaper than taxi’s? Could cost be determined by energy/co2 expended? Maybe the first Hyperloop rides will be really expensive because the PV will not have paid for the system yet but at least it will be along the top of the Hyperloop. Why not have trams that are electrically powered been retro fitted with PV along the tram line? Why aren’t these systems more sustainable? The Colorado Hyperloop will benefit from the recent changes by the EPA force State’s to create power from other than high carbon dioxide sources. “Climate and weather disasters in 2012 cost the American economy more than $100 billion,” the agency says in a document accompanying the proposal. Colorado became the first state with a voter-approved renewable energy standard (PDF) 10 years ago when voters approved Amendment 37 (PDF). The law requires investor-owned electric utilities to provide 30 percent of their energy from renewable sources by 2020, with 3 percent coming from distributed generation. The law has forced energy producers to switch from coal to natural gas and the transition has been relatively smooth. In 2013, 64 percent of the electricity generated in Colorado came from coal, 20 percent from natural gas and 17 percent from renewable energy resources, according to data from the U.S. Energy Information Administration. Currently, Colorado has 12 coal plants. Last updated March 27, 2014. Colorado’s vast fossil fuel resources include the Niobrara shale, with resource estimates running as high as two billion barrels of oil. From 2007 to 2012, crude oil production in Colorado rose 89% and marketed natural gas production rose 38%. In 2013, 64% of the electricity generated in Colorado came from coal, 20% from natural gas, and 17% from renewable energy resources. Colorado’s Renewable Energy Standard requires investor-owned electric utilities to provide 30% of their generation from renewable energy resources by 2020, with 3% coming from distributed generation. Colorado’s grid-connected photovoltaic capacity of 300 megawatts was the fifth largest in the United States in 2012. Average household energy costs in Colorado ($1,551 per year) are 23 percent less than the national average, primarily due to historically lower natural gas prices in the state, according to EIA’s Residential Energy Consumption Survey. Basically Colorado has lots of Coal, but also a lot, and growing, renewables. Luckily, and hopefully, the Colorado Hyperloop will be powered solely by renewables. Mr. Schank advocates using general funds to pay for maintaining and improving our transportation system, arguing that a good transportation system benefits us all, whether or not we personally use it. On the other hand, the nation needs to move toward greater energy efficiency and away from high CO2 pollution rates, and taxing gas-guzzling vehicles higher than others should be effective in making people switch to electric and hybrid cars or use public transportation if the gas tax is made high enough. Also, it’s not fair for those who leave a smaller carbon footprint to subsidize those who leave a big one through general fund taxation. The present gas tax serves a useful purpose; it just needs to be increased, with perhaps more flexibility in how it is spent. One step that really needs to be taken is to get much of our commercial transportation out of large trucks on the road and instead onto rail. Tax the trucks enough to pay to improve the rail lines, which are in deplorable shape in many places. Shipping by trains instead of trucks would reduce CO2 pollution by as much as 90 percent and be cheaper in energy costs as well if rail lines were up to snuff. It would also make our roads, especially interstates, less crowded and safer. If Mr. Schank thinks that raising the gas tax is a non-starter, he certainly should know that raising general revenue taxes is even more of a non-starter in our current Congress. Other modern countries use general revenues for transport, and for national health care. These these are crucial services directly affecting their economies and citizens’ lives. Same for their excellent education system, not relying on local property taxes. And not putting their grads in lifetime debt for college. Americans say, I don’t have kids in school, or I won’t get pregnant, or I don’t use that bridge–so don’t tax me for it. This idea that payment for something should come only from those directly using a service is destructive to our economy and well being. It’s been used to drum up opposition to spending across the board—transport, education, health care taxes, senior benefit programs, etc. Our political polarization and do nothing congress is a cause and result. Pres Obama’s recent infrastructure speech made stark foreign comparisons. The US ranks 19th in infrastructure/transport spending among nations. Europe spends 2X what we do, and China 4X. This spending creates jobs. These facts didn’t get much media coverage. Obama said almost half of Americans have no access to transport. That means they can’t get to jobs, or even look for a job, or get to shops. Some may be past working age, or have to rely on others. But they’re stuck and isolated. What a negative ripple effect on the economy. So our lack of infrastructure spending is directly related to our wealth inequality, downward mobility, and weak consumer demand. The title of this post is Controlling the Colorado Hyperloop Environment. Yes, controlling is a strong word. Does it mean physically or politically? Also, environment means many different things. Is that social, or weather related?For a large transportation project that stretches miles over the horizon, the role of the environment (weather and politically) is critical to system stability. Lets focus on Mother Nature. The hyperloop will be covered in a weather/waterproof cement like tube. These will be the main controlling factor to the environment inside the tubes. Other innovative systems are also trying to control the environment. Take for example a article on NextCity.org about MIT’s CityFarm. So a closed environment is good idea especially if you are trying to do certain, specific things. 2. Urban life is bending toward on-demand. Hyperloop, as Musk sees it, will be made up of pods, or capsules, capable of holding up to 28 passengers each. There will be no need to wait — the vision is for pods to leave every two minutes on average, and every 30 seconds during rush hour. That echoes what we’ve seen with services like Uber or Airbnb, when resources are broken up into discrete bits, whether they’re unused cars or excess rooms, and distributed when and where consumers want them. No more of the “pulsed situation” that we see at airports, Musk writes, where scheduling generates lines. The Hyperloop will, with its regularity, seem like a steady flow. One possibility is that, in turn, it spurs even more on-demand transportation options. If you spend just 30 minutes getting from San Francisco to Los Angeles, you’re unlikely to want to spend another half-hour on a taxi line once you get there. The use of public resources can drive down costs, something Google has found as it has sought to build out Internet access with its Fiber project. Where it’s necessary to build on private land, Musk writes, the advantage of building above ground is that Hyperloop would inconvenience landowners no more than having a telephone pole on their property. 4. Affordability is the key to sustainability. Musk made his first real fortune on PayPal, a peer-to-peer banking system that made it possible for even the smallest of businesses to collect and distribute funds — and which powered the explosive growth of eBay. Now with his Tesla Motors, Musk says that his ultimate goal includes producing “affordably priced family cars” to “help expedite the move from a mine-and-burn hydrocarbon economy towards a solar electric economy.” It’s clear that Musk’s ambition is for Hyperloop to be an leap ahead, environmentally, as compared to existing modes of transportation. For that to happen, he’ll need to pull cars off the road and planes out of the air, which means keeping ticket prices low. 5. Open source is the way ahead. Hyperloop is an “open source transportation concept,” Musk says, “similar to Linux,” wherein the plans are released absent the copyright we might expect to see. Musk has invited feedback, saying “iteration of the design by various individuals and groups can help bring Hyperloop from an idea to a reality.” In particular, he says, he could use help designing the control mechanism for pods and the stations themselves. In their new book, The Metropolitan Revolution, the Brookings Institution’s Bruce Katz and Jennifer Bradley describe federal and state governments as “a collection of hardened silos” where transportation departments design transportation-centric solutions. Cities, meanwhile, are “organic communities” where shared responsibilities can come from anywhere. It helps if plans and ideas, then, aren’t held in a proprietary grasp. It’s an openness to openness that is, in fact, key to the seriousness with which commentators have treated Musk’s role as a transportation entrepreneur. After all, he’s just a man with an idea. So it seems like city farms and hyperloops have more in common to each other than just “controlled” environments.